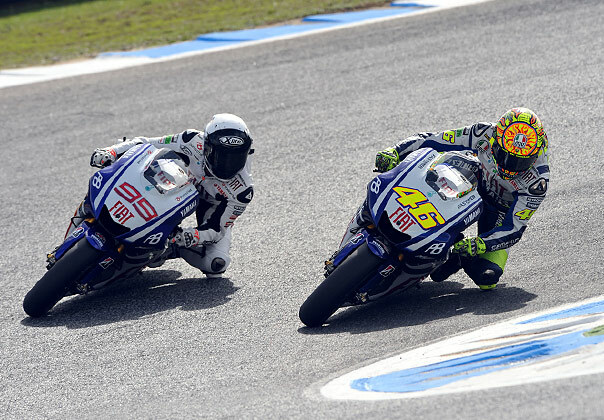 Developers Interview - race | Yamaha Motor Co., Ltd.
A review of the MotoGP 2010 season by the YZR-M1 developers. Developers Interview | Aiming for fourth straight title next year! Shigeto Kitagawa, Senior Manager of Motor Sports Development Division, Motorcycle Business Operations, and President of Yamaha Motor Racing S.r.l. "Looking back now that the season is over, we can say that we performed solidly. But, because both Jorge and Valentino got injured early on, it was touch and go a lot of the time," says Masao Furusawa looking back on the year. 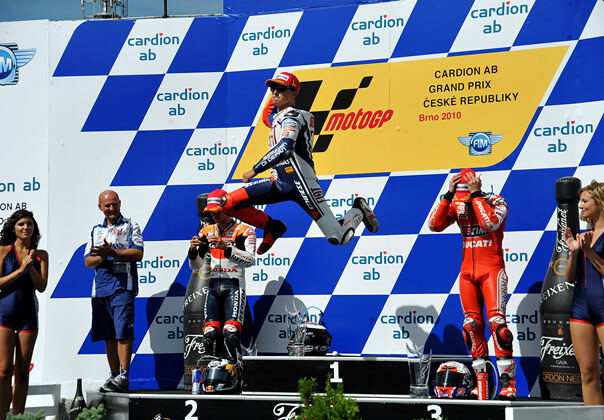 "Valentino won the opening round and Jorge won the second, so it looked like a smooth start. 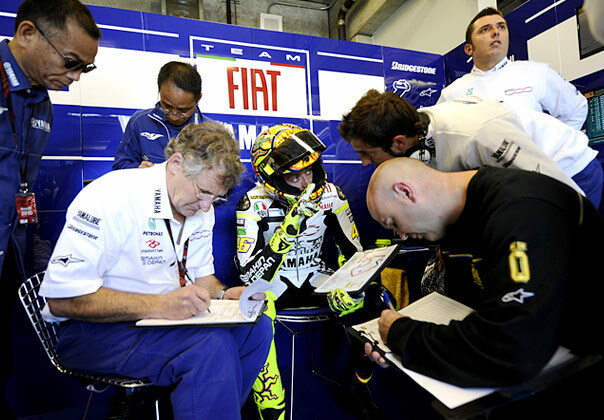 But with Valentino's shoulder giving him problems, he couldn't produce the performances he wanted. Then he fractured his leg, and he was out for a while. Jorge made up for that with consistent wins. He made a complete break with his form up to last year by displaying some very shrewd racing. Thanks to his consistent performance he pulled ahead of the rest of the field in the season ranking. But after Valentino was fit again, the struggle between the two riders heated up, and there were a few very dangerous moments. For people watching the race it must have been interesting, but it was sometimes nerve-racking for those of us on the inside." Masahiko Nakajima also assesses the year as a tough one. "There was just too much going on this year. We weren't able to relax for a moment. It was a season when there was always an injury or something else to keep us busy. Particularly after the Brno round that followed the summer break. We had a long run without a win, which made it an especially difficult time." When winning the championship started to look like a certainty, we all tended to be on the defensive more than we realized. Combined with the increasingly competitive efforts of the other manufacturers, that made a difficult situation even tougher," comments Furusawa. "We could see clearly that the rival manufacturers were gaining strength, so the riders and the staff were getting a little panicky. But when you're on top in the rankings, you can't afford to make a mistake. Amid all that pressure, we did get edgy. That was around the time when the riders started coming to us and demanding in pretty strong terms that we had to improve the machine. When a rider says that the other team is better I think a lot of that is psychological, but it was a fact that the other manufacturers' engine power improved from the middle of the season. Their acceleration out of corners and other points were leaving us behind, so the riders began to panic." Shigeto Kitagawa admits that he was a little panicked himself when rival camps did not show any dip in performance despite the introduction of the new limit of six engines for the season. "To achieve the kind of durability that would allow us to guarantee three or four races on one engine, we really had our work cut out for us during the off-season. We thought the other manufacturers were probably having a tough time of it too and we were expecting their performance to drop a little. But that wasn't the case at all. In fact it was quite the opposite. In the middle of the season, they upped their performance further. We wanted to introduce an engine with increased performance too, but because testing takes time, we couldn't find the opportunity. That made it a hard time for us. So when all our competitors were making progress in machine setup and improving performance, we were having to wait and not keeping pace. About two or three rounds before the final, we brought in the new specifications, and that cleared up the riders' dissatisfaction to a large extent. But in the few rounds leading up to that, the riders were increasingly unhappy and were asking why we were so slow when other teams' engines were so fast. I think Nakajima, who was in the pit, must have taken a lot of that flack." Nakajima himself makes the surprising revelation that the engine restriction actually had some benefits. A regulation that made the going hard for the team could actually be turned to effective use in the pit as a means of persuading riders. But for Jorge, the championship was at stake, so he was pretty nervous in every sense. When a rider can see that his top speed is slow he's going to be unhappy, no matter how fast the lap time is overall. So we could feel that he wanted us to make his job easier by giving him a machine with real fighting power, and that really stung us." 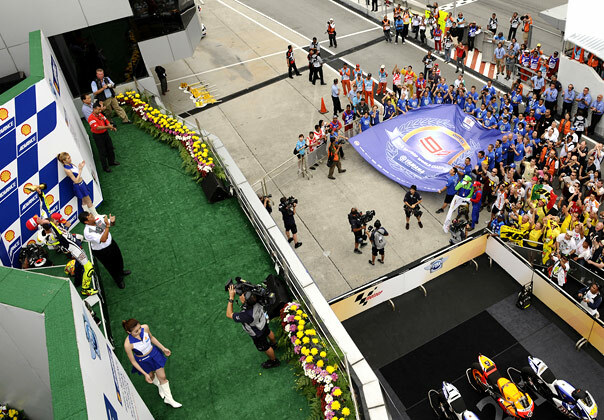 Despite consecutive victories that gave the impression that Yamaha was on a winning streak, behind the scenes the 2010 season was one of constant struggle. If there was one big difference between last year and this year, it was the progress made by Jorge Lorenzo, who won the championship. Praising that progress Furusawa says, "Two years ago he crashed several times during the year and ended the season with only one victory. Last year he had four wins. The amount of progress and the changes in him since then have been enormous. What I notice most of all is that when there's a race that's an easy win for him, he goes straight for it, but when he's threatened and it's dangerous, he holds back. He's changed his strategy so as not to lose points as the season moves into the second half. In that respect, Jorge has really grown. But he has also become more sensitive as well. Now he urges us to do things to remove any disadvantages he feels are affecting him. As Nakajima said just now, he was always asking us to boost the engine power. Also, he has begun telling us not to do anything that would place other riders at an advantage. In other words, he doesn't want to give any unnecessary advantage to the competitors. For instance, at the Valencia test, we let Valentino ride a Ducati, but Jorge was in fact quite unhappy about that. He said, 'Why are you helping our competitors? From next year Valentino will be on the other side you know!' It's not just about his own skill, or just about the bike. As far as the rules let him, he wants to make sure that all conditions work in his favor, and that's a change that has come about this year. Before, I don't think he ever thought about that kind of thing. Compared to last year, Jorge's a completely different person now." This mental change is absolutely necessary for him to become a true champion. Nakajima and Kitagawa are in agreement in acknowledging that certain qualities are needed in a champion. "Riders who become champions direct a great deal of effort into ensuring that they can compete and win under the right conditions. All we do is work out what we can do within the regulations to make ours the fastest machine possible. But the riders have to make use of all the aspects of the race, and all the resources in the circuit, to create conditions that are favorable to them while still competing within the same set of rules. I have worked with many different riders for around 20 years now, but there's never been one who became champion just by being a nice guy and concentrating on how to ride his machine. 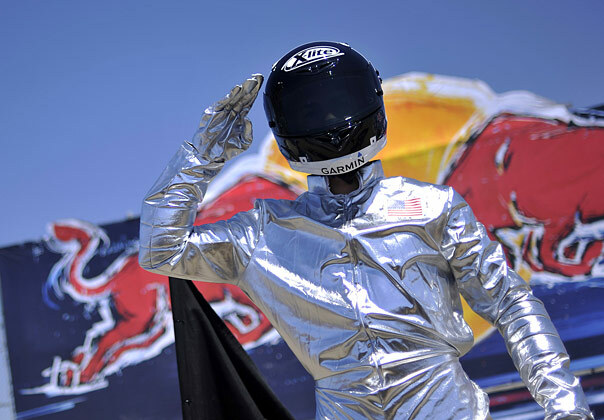 My belief is that you can't be a champion unless you are absolutely committed to winning," says Nakajima. "In a word, it's a question of ambition" says Kitagawa. "To achieve your goal, you have to do whatever it takes to defeat your opponent, so there's inevitably an extent to which you can't afford to be nice about it. You can be a nice friendly guy most of the time, like Jorge, who's a great young man, but when it comes to a situation that's crucial to your victory and your future, you have to find the fighter in you, and I think you can't win if you don't," he adds. Then there's another quality that's indispensable in a rider who wants to be champion: the ability to involve the people around him, the magnetism to inspire people so that they want to give their best for him no matter how tough it gets. One word for it is charisma. Everyone agrees that Valentino Rossi has this gift. Nakajima reckons that Lorenzo has this quality too. "In the middle of the final contest, he almost fell after contact with another bike. Normally, the rider would have crashed and that would have been the end of the race. But he recovered, regained ground, and ended up winning. Seeing that kind of performance makes me think that Jorge really has got something special, and watching him celebrate is a reward for us too. We talk about them being ambitious or hungry, but these riders have a kind of charisma that influences people. In the end, that explains why we feel like doing our best for them."